Fla. Gov. 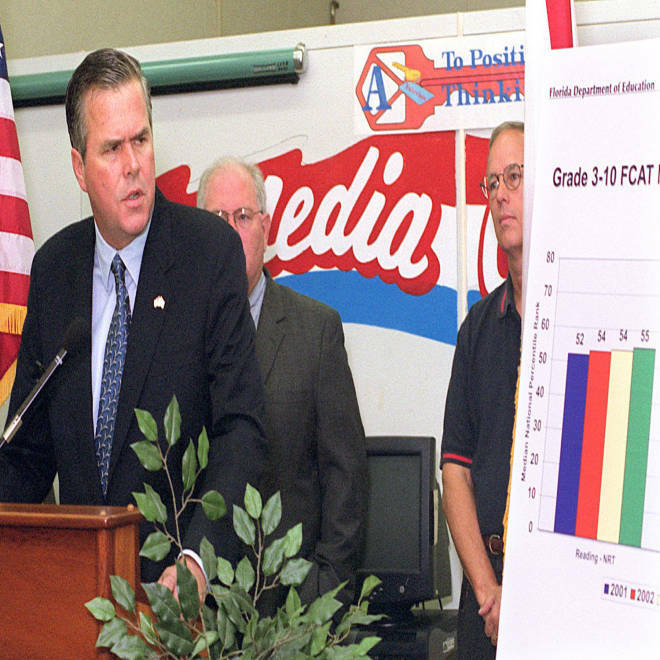 Jeb Bush looks at a chart showing Florida's Comprehensive Assessment Test results in Tallahassee on May 10, 2004. Former Florida Gov. Jeb Bush soared to rock star status in the education world on the strength of a chart. A simple graph, it tracked fourth-grade reading scores. In 1998, when Bush was elected governor, Florida kids scored far below the national average. By the end of his second term, in 2007, they were far ahead, with especially impressive gains for low-income and minority students. Those results earned Bush bipartisan acclaim. As he convenes a star-studded policy summit this week in Washington, he is widely regarded as one of the most influential education reformers in the U.S. Elements of his agenda have been adopted in 36 states, from Maine to Mississippi, North Carolina to New Mexico. Many of his admirers cite Bush's success in Florida as reason enough to get behind him. But a close examination raises questions about the depth and durability of the gains in Florida. After the dramatic jump of the Bush years, Florida test scores edged up in 2009 and then dropped, with low-income students falling further behind. State data shows huge numbers of high school graduates still needing remedial help in math and reading. And some of the policies Bush now pushes, such as vouchers and mandatory online classes, have no clear links to the test-score bump in Florida. Bush has been particularly vigorous about promoting online education, urging states to adopt policies written with input from companies that stand to profit from expanded cyber-schooling. Many of those companies also donate to Bush's Foundation for Excellence in Education, which has raised $19 million in recent years to promote his agenda nationwide. Sherman Dorn, a professor of education at the University of South Florida, says some of Bush's policies as governor, such as an intense focus on teaching reading, made a real difference to Florida students. "It's pretty clear Governor Bush should get credit for giving a damn," he said. But by teaming with for-profit corporations to push cyber-schools, which have produced dismally low test scores in many states, Bush is "throwing away whatever credibility he had coming out of Florida," Dorn said. Bush's allies disagree. For them, the former governor -- widely considered a top contender for the 2016 Republican presidential nomination -- is a visionary striving to build on his record of success. "I've been very impressed with the thoughtfulness of his policies," said Joel Klein, who ran New York City schools for eight years and now heads News Corp's education division, Amplify, which donates to the Bush foundation. Klein and officials at several other education companies that support Bush's foundation say they do so not for their own financial interest but to promote a broad policy debate. Any implication "that corporate donors give to us for us to advance their agenda" is simply false, said Patricia Levesque, the foundation's executive director. Bush, who declined to comment for this story, says often that he has one abiding goal: to give all students the chance to reach their "God-given potential." * Grade schools on an A-to-F scale, based mostly on student scores and growth on standardized tests. Give students in poorly ranked schools vouchers to attend private and religious schools. * Hold back 8-year-olds who can't pass a state reading test rather than promote them to fourth grade. * Expand access to online classes and charter schools, which are publicly funded but privately managed, sometimes for profit. In Florida, Bush paired his tough-love measures with generous support. Schools that improved their grade or got an "A" received extra funding. Teachers got bonuses for successes like getting more kids to pass Advanced Placement tests. And students required to repeat third grade got intensive help at free summer reading camps. States adopting the policies now, in a time of austerity, tend to leave out the costly support systems. That has stirred protests from school superintendents, school board members, teachers unions and parents who see the policies as punitive, humiliating and too narrowly focused on a single test as a measure of success. Voters have spoken loudly, too. In this month's election, overwhelmingly Republican electorates overturned Bush-style reforms in Idaho and South Dakota and ousted the Indiana state schools chief, who had enacted much of the Florida formula. In Florida, meanwhile, the durability of the Bush-era gains has come into question. High school graduation rates rose during Bush's tenure but remain substantially lower than in other large and diverse states, including California, New York and Ohio, according to new federal data. Students' average score on the ACT college entrance exam has not improved and remains well below states such as Missouri and Ohio, where a comparable percentage of students take the test. Florida's scores on the National Assessment of Educational Progress, widely considered the most reliable metric, dropped on all four key tests last year -- fourth- and eighth-grade reading and math. On all four tests, low-income students fell further behind their wealthier peers. Jaryn Emhof, a spokeswoman for the Bush foundation, said the slipping scores are an indication that "schools were getting complacent" and need to be pushed with higher standards. Opponents contend Bush's reforms never deserved much credit for the gains in the first place. Other factors were at play, they argue. Florida voters passed a constitutional amendment to limit class size in 2002, for instance. And Bush's tenure coincided with soaring property tax receipts, thanks to the housing boom, which led to more local funding for schools. Per-pupil spending in Florida jumped 22 percent from 2001 to 2007, after accounting for inflation. It has since fallen sharply. "There's this single-minded notion that only the program has supported yield improvements," said Ruth Melton, director of legislative relations for the Florida School Boards Association. "There's more to this than meets the eye." Some recent research has cast doubt on the long-term effectiveness of the Bush policies. A Harvard education research group reported this summer that Florida students who were held back in third grade notched a big boost in test scores initially, but the effects faded to insignificance before they entered high school. And annual studies commissioned by the state have found no evidence that low-income students who receive vouchers to attend private schools do any better at reading or math than their peers. As for Florida's charter schools, a recent report found their students consistently outscore kids in traditional schools on state tests. The charters, however, serve fewer poor and special-needs students and fewer students still learning English. Meanwhile, researchers have found that other states, such as Massachusetts, have boosted achievement without Florida-style reforms, using more old-fashioned remedies such as increasing spending and imposing rigorous curricular standards. After an exhaustive study of state-by-state academic gains, the Harvard researchers concluded in a July report that "the connection between reforms and gains ... thus far is only anecdotal, not definitive." Emhof, the Bush foundation spokeswoman, said that while "there is no silver bullet" to improve schools, the Florida formula "is the path with the most proven results." The state's size and diversity mean "if something works in Florida, it can work anywhere," she said. Indeed, the Bush foundation touts the Florida test gains as "perhaps the greatest public policy success story of the past decade" and aggressively presses its formula on other states. Hundreds of emails obtained under a public records request by the nonprofit advocacy group In the Public Interest, which opposes privatization of schools, show the foundation working closely with allies in Maine, New Mexico, Florida and elsewhere to craft public policy. Foundation employees write legislation and edit proposed bills line by line, then send in experts to testify on their behalf, the emails show. The Bush foundation also funds trips and events to introduce Bush's donors to policy makers. At last year's national summit in San Francisco, the foundation set aside two hours for several state superintendents of education, dubbed "Chiefs for Change," to meet the foundation's sponsors. In an email forwarded to Executive Director Levesque, an official from Apple Inc. also requested access to the chiefs to tout the company's products. "This is a great opportunity. ... But there are a dozen other companies that want access," Levesque responded. She couldn't accommodate Apple, she wrote, unless the chiefs first found time to meet with "all the other companies including those actually funding" the Chiefs for Change network. Bush foundation donors include family philanthropies, such as those established by Microsoft founder Bill Gates and New York City Mayor Michael Bloomberg. Corporate donors include Connections Education, a division of global publishing giant Pearson; Amplify, the education division of Rupert Murdoch's News Corp.; and K12, a publicly traded company that runs online schools. Many of these donors sit on a Digital Learning Council that helped draft the Bush foundation's policy agenda. Key planks call for states to require online course work in high school and to lift restrictions that hinder cyber-school growth, such as limits on class size. Studies in several states including Pennsylvania and Colorado have found that online students fare far worse than their peers in reading and math. Bush has said bad programs should be shut down, but he believes online schools have great potential to offer personalized, self-paced education. "This is not about our commercial success," said Sari Factor, chief executive officer of E2020 Inc., which develops online curricula and recently signed up as a foundation sponsor. "We're focused on what's right for kids." Still, Factor acknowledged that E2020 has "absolutely" benefited from Bush's advocacy. In particular, Bush often talks up an Arizona charter school called Carpe Diem, which uses the E2020 online curriculum, employing just four teachers for 225 students because the kids do so much work online. Bush has flown policy makers from across the country to admire the school's innovation and cost cutting. That has brought more clients to E2020, Factor said. Arizona data shows Carpe Diem test scores have fallen sharply over the past two years, a drop founder Rick Ogston attributes to a new curriculum and the sudden death of the principal. That has not slowed its momentum; after visiting Carpe Diem on a trip paid for by the Bush foundation, Indiana officials urged Ogston to apply to open a branch there. The head of the state charter school board, Claire Fiddian-Green, says the school's "fairly strong track record" impressed her despite the recent slip in test scores. The new Carpe Diem campus in Indianapolis opened this fall. Ogston said he and other charter and online school operators count on Bush's foundation to remove obstacles to their growth, such as state laws that require students to put in time in a physical classroom. "We come to them to say, 'These policies are in the way, and it would be great if you could change them,'" Ogston said. "That's what they do better than anyone."